We’d love your help. Let us know what’s wrong with this preview of No Way Out by Cara Hunter. The Christmas holidays, and two children have just been pulled from the wreckage of their burning home in North Oxford. The toddler is dea DID YOU SEE ANYTHING ON THE NIGHT THE ESMOND FAMILY WERE MURDERED? Do you have to read the previous two books to follow along with this book? With all the elements that we’ve come to expect for an excellent police procedural, Cara Hunter’s, ‘No Way Out’ looks like another sure fire winner for this gifted author. It’s the third in the series, and this particular story begins at the scene of a house fire in North Oxford. Two children are pulled from the wreckage of the fire - three year old Zachary is already dead and his older brother Matty is in a critical state, and the prognosis isn’t good. It looks like the children were home alone, (there being no sign of their mother) and their father, who is attending a conference in London isn’t answering his phone. What makes this tragedy even worse is that all the evidence points to the fire having been started deliberately. DI Adam Fawley and his team have a particularly poignant case to deal with here - not only are there children involved, but it was around Christmas time as well, and although DI Fawley’s team are an eclectic bunch, they’re nothing if not tenacious, and this case will eat away at them like no other has, and none of them will rest until they’ve resolved it. Oh gosh, this case was like peeling away the layers of an onion, each layer revealing a little more until it gets right to the heart of the crime. The narrative flits between past and present, allowing us to gain great insight into this family unit, and ultimately how and why this tragedy came about. DI Fawley takes something of a backseat this time around, but that allows the others in his team to shine and I loved that. As ever, Cara Hunter has produced a storyline that has great pace and lots of twists and turns, with a truly neat little twist at the end. I can’t wait for the next in the series- though I guess I’ll have to! No Way Out is Cara Hunter’s third book in the DI Adam Fawley series and it is every bit as captivating, pacey and clever as the others. Cara’s style is unique, refreshing and excitingly modern, with content added to the narrative in the form of emails, social-media chatter, news boards and interview transcriptions. It may sound overwhelming but it is so perfectly placed in the story that it brings a gamut of full on stimulation. I found it created a more effective impact to hear major and essential information from a news source or police report. The use of these techniques is not overdone and is handled throughout with careful control while maintaining an incredibly traumatic, fascinating and suspense driven plot. The great crime procedurals have teams of characters that bring depth and context. Cara brings a wonderful cast of characters that are evolving within the series and we become engrossed in their lives and the interactions they have amongst themselves. There seems to be a concerted effort in Cara's books to add depth to the characters in terms of introducing their private lives that aren't feeding the plot but adding reality and personality to the story. The story starts with the details coming through of a house fire in Oxford that completely destroys the Esmond family home and sees 2 children pulled from the wreckage. The youngest, Zachary, died in the fire but his older brother Mattie is still alive and clinging to life in a hospital ICU. Samantha Esmond, their mother, is missing and the father, Michael, is away at an academic conference in London, and cannot be tracked down. The plot slowly unfolds as investigative results open up avenues that a team of expert detectives led by DI Fawley and his acting DS, Chris Gislingham know how to probe and dig, and pull it all together. It is utterly absorbing how the elements are delicately revealed without the need for the big dramatic shift to the end game. The plotting is intelligently layered and each team member brings their own skills and experiences in advancing the investigation. The mood of the story is impressively managed as it switches from the distressing realisation that a child has died and the harrowing discoveries that are still to come, to the resolute, sometimes monotonous, investigative activities that a tenacious team of detectives are determined to resolve. This case resonates with them, particularly Fawley, as he lost a child some years back and as a consequence, his marriage is under a lot of pressure, as Fawley and his wife have their own separate horrors and means of dealing with the tragedy. Cara’s wonderful array of characters, clever gripping plot, and detail delivered through various interesting formats ensure this will be a well-deserved best-selling novel. I would highly recommend this book. Cara is one of the best crime thriller writers around today. I would like to thank Cara Hunter and Penguin Books UK for an ARC version of the book in return for an honest review. Cara Hunter's fast paced crime fiction, the third in the DI Adam Fawley series, with Thames Valley Police set in Oxford, is hugely compelling reading. In what is now her trademark style of including phone calls, emails, interviews, news websites and social media in the narrative, she provides a style that works brilliantly in immersing the reader in the story. In this police procedural, DI Fawley takes a more backseat role, and for good reason, he is an emotional wreck as a schism has opened wit Cara Hunter's fast paced crime fiction, the third in the DI Adam Fawley series, with Thames Valley Police set in Oxford, is hugely compelling reading. In what is now her trademark style of including phone calls, emails, interviews, news websites and social media in the narrative, she provides a style that works brilliantly in immersing the reader in the story. In this police procedural, DI Fawley takes a more backseat role, and for good reason, he is an emotional wreck as a schism has opened with his wife, Alex, who has left him to stay with her sister. After the death of their son, Jake, Alex was pushing Adam to adopt, something he is not ready or capable of doing, leaving him terrified that this will signal the end of their marriage. This leaves his police team, led by Acting DS Chris Gislingham, demoted DC Quinn, DC Erica Somer, DC Verity Everett and others to play the primary and pivotal role in this most harrowing of investigations. Southey Road in North Oxford is the home of the academic Michael Esmond, wife Samantha and their children, 10 year old Mattie and 3 year old Zachary. Over the festive season, a fatal fire at the house claims the life of Zachary, although Mattie is pulled out alive but it is not clear if he will survive. Michael is at a academic conference in London and the police hunt for Samantha. Right from the beginning the fire brigade suspect arson, who would want to commit such a heinous crime? In a narrative that goes back and forth in time, we become intimately acquainted with the Esmond family that includes Michael's carefree brother, Philip, who spends time sailing round the world, Michael's university colleagues, Samantha's severe post-natal depression, their employment of Harry who tends to their garden. DC Quinn is resentful and struggling to accept DS Gislingham leading the inquiry and has yet to come to terms with his demotion. The police struggle to locate Michael, and have to sift their way through a host of suspects before the horrifying truth begins to emerge. After only just reading “ In the dark” by Cara Hunter I was delighted, no let’s be honest I was over the moon to get the opportunity to review this book from Netgalley in exchange for a copy. A very chilling start with a house fire and the fire brigade searching for the family. so descriptive I actually felt like I was there experiencing the heat of the fire!! At the start this seems to be a simple case, but no Cara Hunter keeps us guessing with plenty of twists and red herrings along the way. Thi After only just reading “ In the dark” by Cara Hunter I was delighted, no let’s be honest I was over the moon to get the opportunity to review this book from Netgalley in exchange for a copy. This story is narrated before and after, so we gradually find out what happened the day of the fire. The mix of social media, news and Police statements make this feel like a real crime and that the reader is the one who has to solve it. Love having the same police team investigating and finding out what is happening in their personal lives. If you haven’t read this series then you are MISSING OUT!! It's the Christmas holidays, and two children have just been pulled from the wreckage of their burning home in North Oxford. The toddler is dead and his brother is fighting for his life. Why were they left in the house alone? Where is their mother? Why does their father not answer his phone? This is an emotional, addictive and fast paced read. DI Fawley and his team are back. Fawley's mind is not properly on the job so he hands the case of the house fire, where a child has died and another one is fighting for his life, over to Gis to investigate as acting DS. The story is told from the investigation and the events that took place 317 days before the fire in the victims' house. The plot is full of twists and the tension builds. We get to know DI Fawley and his team a little better as their characters develop. This series just gets better and better. Another first-rate domestic noir police procedural from an author who never disappoints. 23 Southey Road – once home to a family of four – now lies in ruins due to a horrific overnight house fire. Two young boys have been found inside – one dead, the other fighting for his life in intensive care. Worst still, the parent's are nowhere to be found, and the family car is missing. If that's not bad enough, everything about the fire points to arson. What kind of monster would set fire to a house with Another first-rate domestic noir police procedural from an author who never disappoints. 23 Southey Road – once home to a family of four – now lies in ruins due to a horrific overnight house fire. Two young boys have been found inside – one dead, the other fighting for his life in intensive care. Worst still, the parent's are nowhere to be found, and the family car is missing. If that's not bad enough, everything about the fire points to arson. What kind of monster would set fire to a house with two little kids inside? And what kind of parents would leave their children home alone in the middle of the night? This is the third entry in the series, and all three books have been 5 star reads for me. The crime was another puzzler with all the twists and turns I've come to expect from this gifted writer, culminating in yet another stellar ending. Again there's an even split between the police investigation in the present, and what led up to the crime, in this case 317 days before the fire working forward. It could be read as a standalone novel, but to get most out of the characters, I recommend starting at the beginning, and believe me Close to Home and In the Dark are just as worthy as this one. Cara Hunter does an expert job of dropping teaser hints, all the while careful not to spoil anything, regarding her previous novels, so that if this is your first read by her you will be intrigued enough to check out the rest. All the characters I've grown to love over the past two books are back, complete with a hefty dose of their personal lives. It’s dramatic, gossip-fueled, soap opera-ish, but it works, and I eagerly lapped up those bits. I think because the crimes depicted in this series ares so serious and sensitive, and thus far have all involved children, that it's nice to have a break once and a while and follow the character's on their downtime. The house fire at 23 Southey Road was horrific. The destruction complete. And the knowledge that it was done deliberately sent a shiver down the respondents’ spines. When the two children were pulled from what was left of the house, one deceased, one critical, the police couldn’t work out where their mother or father were. Would they be found in the remains? Or had they left their young children unattended? Detective Inspector Adam Frawley knew they had to find answers and quickly. But with it be The house fire at 23 Southey Road was horrific. The destruction complete. And the knowledge that it was done deliberately sent a shiver down the respondents’ spines. When the two children were pulled from what was left of the house, one deceased, one critical, the police couldn’t work out where their mother or father were. Would they be found in the remains? Or had they left their young children unattended? Detective Inspector Adam Frawley knew they had to find answers and quickly. But with it being Christmas holidays, a lot of places were closed. He and his team needed to sift through the evidence, sparse though it was, and come to some conclusions. Was it an accident? Was it murder? What would they find? No Way Out is the 3rd in the DI Adam Frawley series, and once again it’s a convoluted and traumatic case. Author Cara Hunter writes a thriller that gets the reader in; but I didn’t enjoy this one as much as the first two I’m afraid. A little too drawn out in my opinion, with the style of writing – the texts, emails, interviews; all in italics - disconcerting. But that said, I’m happy to recommend it to thriller fans. The next Adam Fawley novel from Cara Hunter is pacy and twisted, an addictive read with a strong emotional core featuring as it does a family in peril. This series is growing in stature with each passing tale- No Way Out ups the ante, moving along the lives of its main protagonists whilst they investigate a heart wrenching case which just gets murkier with each new clue. I like the interim news articles and emails, as well as the mixture of views which allows the reader to see the case from many a The next Adam Fawley novel from Cara Hunter is pacy and twisted, an addictive read with a strong emotional core featuring as it does a family in peril. I like the interim news articles and emails, as well as the mixture of views which allows the reader to see the case from many angles including that of victim. It makes for a rich, well layered crime novel with a good dose of unpredictability. Overall this is a series to watch. I’ll definitely be sticking with it, intriguing characters and clever plotting. No Way Out is the third book in the DI Fawley series and would definitely recommend at least reading the second book before reading this one as readers would definitely benefit from it. After the cases in the first two books, the case that Fawley and his team find themselves working on seemed quite a straight forward one. I could feel myself slump a little bit as this is what has made this series so far is the complexity and how twisted the cases are. The further into the book I got though, thing No Way Out is the third book in the DI Fawley series and would definitely recommend at least reading the second book before reading this one as readers would definitely benefit from it. After the cases in the first two books, the case that Fawley and his team find themselves working on seemed quite a straight forward one. I could feel myself slump a little bit as this is what has made this series so far is the complexity and how twisted the cases are. The further into the book I got though, things are definitely not quite as simple as they first appear and the twists and turns that I have come to love hit me full force and made my heart soar. The story flicks between present day with the police working on the case and to brief parts in the past with the family who live in the house and the build up to the night of the fire. This gives the reader the chance to get to know the family better and I loved getting an insight into their family life. As usual the author has the reader agonisingly waiting for more of Fawley and his home life. For me, finding out what was going on there was just as important as the case. Please, please, please don't make us wait as long in the next one. I don't think my heart can stand it! No Way Out is yet another brilliantly dark and twisted read. I absolutely love how this authors mind works and she sure knows how to grab and hold her readers attention. From picking the book up, every time I put it down to get on with real life stuff, it's all I could think about, wondering what else the author had in store for me and where the case was going to lead to next. A truly brilliant and clever crime series. No Way Out is the gripping third book in the DI Fawley series, and although I didn't enjoy it quite as much as the previous two it's still a great, entertaining read. It's a perfectly paced story written in Hunter's eminently readable style and is very quick to get through. If you enjoy well-crafted gritty plots, twists turns and red herrings and a clan of experienced, compassionate investigators then give this a go. Many thanks to Penguin for an ARC. This is the 3rd book in what is definitely my new favourite police procedural series and I can honestly say that Cara Hunter is an author I would happily read WITHOUT reading the blurb because whatever she’s writing I now know after 3 books that I absolutely LOVE her writing style and her storylines. No Way Out is set approximately 6-8 months after In The Dark and features the same wonderful team of Adam Fawley, Gislingham (Gis), Quinn, Somer and Everett. DI Fawley is going through a very diffic This is the 3rd book in what is definitely my new favourite police procedural series and I can honestly say that Cara Hunter is an author I would happily read WITHOUT reading the blurb because whatever she’s writing I now know after 3 books that I absolutely LOVE her writing style and her storylines. No Way Out is set approximately 6-8 months after In The Dark and features the same wonderful team of Adam Fawley, Gislingham (Gis), Quinn, Somer and Everett. DI Fawley is going through a very difficult personal situation and his mind really isn’t on the job so when a house fire kills a toddler and his 10 year old brother is pulled from the fire fighting for his life Fawley hands the case over to Gis to run as Acting DS. The change in leadership enables to reader to get to know the rest of the team in more detail which I particularly enjoyed. Even though DI Fawley has taken a back seat during this case, he is still very much part of the investigation and his wonderful wit and observations are evident throughout. Once again the author has used social media, news articles and comments from the public to give the story the additional depth and allows the reader to see several sides of the story from different perspectives. Okay, this is the third book in the DI Adam Fawley series but it can be read as a standalone. You do not need to know what happened in the other books. This is a good move by Cara Hunter. Yes, the old characters from the other novels who work in or for Thames Valley Police are carried forward and this continuation simply added further pleasure to my enjoyment of this book. No Way Out is a police procedural set mostly in Oxford. There is a fire at a house in Oxford and it looks like arson. Sadly p Okay, this is the third book in the DI Adam Fawley series but it can be read as a standalone. You do not need to know what happened in the other books. This is a good move by Cara Hunter. Yes, the old characters from the other novels who work in or for Thames Valley Police are carried forward and this continuation simply added further pleasure to my enjoyment of this book. No Way Out is a police procedural set mostly in Oxford. There is a fire at a house in Oxford and it looks like arson. Sadly people were inside and the Fire Service begin the search for survivors or fatalities. Who would start a fire on this family home? DI Adam Fawley and his team at Thames Valley Police are on the case to solve this mystery. I enjoyed reading No Way Out. You get this story from two sides, the Thames Valley Police and the family who live at Southey Road. It felt odd that I knew more about what was happening with the family than the police did but that is the way Cara chose to tell her story. And boy, can Cara tell a story, YES she can! What I liked most about No Way Out was all the finger pointing that Cara does. Lots of people have strong motives to set fire to this family home, time and time again they have the finger pointed at them. There is a good range of characters in No Way Out and anyone of them could have started the fire. The tone of this novel is very different to most crime thrillers. Generally the reader develops a sympathy for the victim but with No Way Out, the police view the whole family as suspects. As a reader your sympathy lies with the police, who have an extremely difficult investigation, simply because the dead don’t talk. The plot within No Way Out was very, very good indeed. It was of the same high standard we get from Linwood Barclay and Harlan Coben - yes, the premier league of crime fiction. At the end, all those little bits of detail added up and the arson of the family home made sense. Of course, if I spot a person sat on their own in Pizza Hut, my suspicions will be on alert! Some details just stick with you! I got a lot of pleasure from reading No Way Out and I feel that Cara has done it yet again. I found No Way Out to be an OUTSTANDING read and it gets the top score of 5 stars from me. With thanks to Netgalley and Penguin for this ARC in exchange for an open and honest review. No Way Out is the third book featuring DI Adam Fawley and his team. Newly promoted DS Chris Gillingham soon discovered the house belonged to academic Michael Esmond, his wife Samantha and their two children three year old Zachary and ten year old Matty. The parents were not in the house and It was thought the kids were home alone. Gillingham soon found out that Michael was attending an academic conference in London The team tried to find Michael but he had disappeared. When forensics started to examine the house they found Samantha`s dead body. When the team started digging into Michael Esmond`s life they found he was under a lot of pressure. Michael `s older brother Philip was their parents favourite, years later Michael still felt second best. Weeks earlier a pupil had made an allegation of inappropriate behaviour, also Samantha was suffering post natal depression and Michael was having to care for the care for the children. I really enjoyed this carefully crafted story. I thought it was clever showing the Esmond`s lives in the months leading up to the devastating fire. The book was definitely twisty turny, Each time I guessed what had happened, I had to think again when a new clue was found. Like in Cara Hunter`s previous books I enjoyed the interview transcripts and social media posts. It was interesting to read the fictitious readers view of the fire and Michael Esmond. No Way Out was long book but I was so immersed in the story it went quickly. My only criticism is my ARC was not divided into chapters so it was difficult to know how much I had read each day. Adam Fawley received some good news at the end of the book. I look forward to the next book to see Adam`s reaction. I would like to thank Netgalley and Penguin Books UK for an advance copy of No Way Out, the third novel to feature Oxford based DI Adam Fawley. When a house goes up in flames firefighters manage to rescue a 10 year old boy and find his 3 year old brother dead in his bed. Fawley and the team have more questions than answers because arson is immediately suspected and there is no sign of the parents. 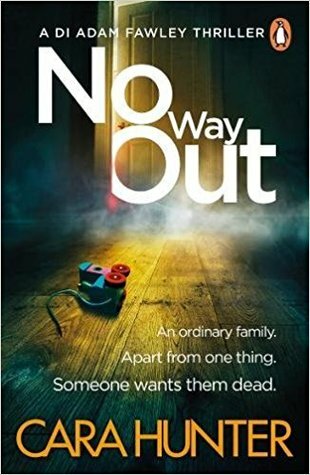 I thoroughly enjoyed No Way Out which is a compulsive read with plenty of twists and turns, most of w I would like to thank Netgalley and Penguin Books UK for an advance copy of No Way Out, the third novel to feature Oxford based DI Adam Fawley. I thoroughly enjoyed No Way Out which is a compulsive read with plenty of twists and turns, most of which come as a complete surprise. The format of shifting timelines and points of view is not one I usually enjoy but it is so well done it kept me reading throughout, hooked on all of them. The timeline switches between the present day investigation and a countdown of life in the victims' house from 317 days before the fire. What happens in the house is fascinating and as the detectives know nothing about it it provides the reader with a counterpoint to their speculation and theories and proves what a mistake jumping to conclusions can be. I really like the contrast as it makes for an interesting read. The shifting point of view is equally absorbing. Fawley's narrative is in the first person and everything else in the third. It gives a wider perspective on the investigation as it encompasses other members of team, transcripts of phone interviews and on-line press reports, complete with very realistic reader comments. Together they build a picture of the investigation and the wider reactions to it. I found it natural, realistic and absorbing. The plot itself is clever and well done, just as you think you have a good idea of what happened Ms Hunter throws in another curve ball and you're left doubting your scenario and you can't help trying to formulate another with the new information. It makes for great reading. Ms Hunter does not neglect her characters either. Many of the detectives have minor dramas in their lives, making them seem very human but she saves the big one for Fawley. His wife has left him for some thinking time and he's not coping as his house, appearance and concentration are a mess. Fortunately it doesn't appear to affect his ability to work the case. Really enjoyable quick read - exactly the right kind of novel I needed after the heavy-going Madame Solario. I absolutely loved Cara Hunter’s previous two novels, so when I spotted the third one on NetGalley it took approximately a nanosecond to bang in a request, and I was delighted to have it accepted. I’m rapidly realising that much as I enjoy a nice twisty turny etc psychological thriller (well, some of them), there’s really nothing I like better than a good old investigation. (I was raised on Golden Age detective stories, after all.) Police, private detective or amateur, I don’t mind - the likes o I absolutely loved Cara Hunter’s previous two novels, so when I spotted the third one on NetGalley it took approximately a nanosecond to bang in a request, and I was delighted to have it accepted. I’m rapidly realising that much as I enjoy a nice twisty turny etc psychological thriller (well, some of them), there’s really nothing I like better than a good old investigation. (I was raised on Golden Age detective stories, after all.) Police, private detective or amateur, I don’t mind - the likes of Robert Galbraith, Jane Casey and now Cara Hunter are right up my street or indeed dark alley. No Way Out follows Oxford DI Adam Fawley and his team as they investigate a particularly disturbing case - a horrific house fire in which two young children were trapped. It’s clearly arson, but who would do such a thing, and why? And furthermore, where are the children’s parents? As ever, it’s a well constructed and intriguing plot with plenty of surprises - I didn’t guess the outcome ahead of time. The police characters are very well drawn and believable and the excerpts throughout not only from interviews but media reports and indeed the comments below them adds another dimension. DI Fawley has significant personal issues of his own to contend with (what he has experienced in his family life is dreadful) but never seems to allow it to impact on his professionalism. Another excellent story from Cara Hunter and I can’t wait for the next one! I really enjoyed the story but intensely dislike the way it's written. It's very much like the first book in this series. The 2nd book was so much better because it edged away from inserting so many texts, emails etc. Half of what they contained was unnecessary to the story and it makes the author seem lazy, as if they can't be bothered to write the story properly. The occasional submission may be alright but this book was littered with them and they do nothing to enhance the story. As usual the author has the reader agonisingly waiting for more of Fawley and his home life. For me, finding out what was going on there was just as important as the case. Please, please, please don’t make us wait as long in the next one. I don’t think my heart can stand it! No Way Out is yet another brilliantly dark and twisted read. I absolutely love how this authors mind works and she sure knows how to grab and hold her readers attention. From picking the book up, every time I put it down to get on with real life stuff, it’s all I could think about, wondering what else the author had in store for me and where the case was going to lead to next. A truly brilliant and clever crime series. The crime genre is tightly packed with budding authors eager to display their writing skills as they start a new story with new characters and usually a slightly flawed lead detective. The hope is that if the story and main players are welcomed by an eager reading audience then further books will follow as a series is born. The problem is that there are now far too many so called authors plying their trade with the result that the writing is often bland and stereotypical in its delivery. No way o The crime genre is tightly packed with budding authors eager to display their writing skills as they start a new story with new characters and usually a slightly flawed lead detective. The hope is that if the story and main players are welcomed by an eager reading audience then further books will follow as a series is born. The problem is that there are now far too many so called authors plying their trade with the result that the writing is often bland and stereotypical in its delivery. No way out is the third in a series featuring DI Adam Fawley and his intrepid band of warriors; Gislington , Quinn, Somer and Everett. A fire has occurred in a residential property, one child dead and one child clinging to life. It would appear that the parents are not in residence, and so the search is on to find them, the hope being that they can provide clues and answers to this appalling crime. Due to personal circumstances DI Fawley has stepped down as lead detective and has entrusted the investigation to her colleague Gis promoted as acting DS on this occasion. No way out is the third book in the DI Fawley series by Cara Hunter. I was looking forward to reading this, as I have read the previous two and loved them. The team investigate a fire in 23 Southey Road in Oxford. Where a mother and her three-year-old boy has died and the oldest son is critically ill in hospital. They expect arson, after they discover that the house is doused in petrol and Michael Esmond is nowhere to be seen and his car is missing from the drive. They expect Michael to have star No way out is the third book in the DI Fawley series by Cara Hunter. I was looking forward to reading this, as I have read the previous two and loved them. The team investigate a fire in 23 Southey Road in Oxford. Where a mother and her three-year-old boy has died and the oldest son is critically ill in hospital. They expect arson, after they discover that the house is doused in petrol and Michael Esmond is nowhere to be seen and his car is missing from the drive. They expect Michael to have started the fire. As they investigate further into the lives of the family, they find out that Michael is just about to lose his job, and they are also in financial trouble. Is this a reason to set fire to this house? Maybe to claim the insurance? The story also goes back and forth in time, telling us of the events, that led up to the day of the fire and the reason behind it. I really enjoyed reading the first two books in the DI Fawley series and I’m pleased to report that Book 3, NO WAY OUT, was just as thrilling. The story is told in present day and flashbacks, revelations drip fed to keep the reader turning the pages. The plot is twisty and full of tension and chilling details. As with her other narratives, the author peppers the storyline with lots of interesting detail such as emergency call logs, tweets and newspaper articles. The characters are well-developed I really enjoyed reading the first two books in the DI Fawley series and I’m pleased to report that Book 3, NO WAY OUT, was just as thrilling. The characters are well-developed and it was enjoyable getting to know DI Fawley and his team a little better. Looking forward to the next book! Recommended. Despite the subject matter being upsetting in places I thought this was the best book of the DI Adam Fawley series so far. The plot was well-crafted, believable and I was surprised by many of the twists. I love the format, the interview transcripts and reports etc make for very quick reading and make the police procedure that little bit more authentic. I also thought the switching between past and present events was very cleverly done. Looking forward to Cara Hunter’s next novel in the autumn. No way out by Cara Hunter. Because this fire wasn't an accident No way out by Cara Hunter. This was just the book I needed to get me through my yearly book lull. Happens every September. A fast paced, mystery thriller - Who set fire to the Esmonds mansion resulting in the tragic murder of a family? I loved how many times I thought I had solved it (but hadn’t). I enjoyed being back with the police team of Fawley, Gislington & Quinn. I will not forgive myself for waiting so long to discover Cara Hunter! I go through huge amounts of crime fiction every month, so it has become more arduous to find exhilarating books. I love murders and blood, yes, but I feel myself wanting more, becoming pickier, searching for an invigorating writing style, a different format, a thrilling voice… Basically, I’m a teen looking going through all the dresses in a store to find THE dress. Well, my dress is by Cara Hunter! No Way Out caught me off guard. The DI Fawley series was new to me so I walked in blind and excited. Don’t we love this feeling? Usually, it fades away while I make my way through a plot and get accustomed to the characters. This time, I stayed transfixed during the entire investigation. This book is made of reports, phone calls, texts, newspaper articles. Simple trick to spice things up? Nope. There is nothing simple in the utterly detailed and skillfully planted forms of narration contained in this novel. I was in awe of all the extra work put on there to make this case as real as possible. Did those extras work? Yes. Oh, yes, they did. I was an inhabitant of Oxford, reading the papers in the kitchen with my tea. I was the little mouse going through phone logs, unsure of what to look for. I was the police officer stuck at her desk with gruesome reports. I was part of the book! I was in the middle of a complex network, engulfed by the horrors of the events and the thrill of running after answers. One thing had me work twice as much, for at least for a third of the novel. Unfamiliar with the series, it took me a little bit of time to understand whose shoes I was in, whose voice I was listening to, as point of views changed several times in a chapter. However, as I sank deeper into the abyss, I gathered information, learned to recognize signs and manners of speech. Midway through, I was able to swim smoothly in all waters and strike reader/characters relationships with everyone. I think this choice from the author spurred me to give No Way Out a piece of myself, and I truly feel it made a huge difference in the way I enjoyed the novel. Something personal was created. Something both good and terrifying, but most of all absolutely satisfying for a reader like me! You might wonder about my mental state if I enjoyed getting personal with a case involving the death of children in one of the most horrendous ways. Again, Cara Hunter pulled the right strings, never overplaying the drama, although still making sure the reader gets all the feels. I’m. not a crier. I cried. Then I go angry. Two kids discovered in their house on fire, parents missing. I was shocked, paralyzed, numb. Why wasn't the father answering his freaking phone? Where was the mother? What on earth happened in this house? I did not have to imagine the nightmare, the author served it on a plate. It broke my heart and fueled my body with a burning desire for justice. Little did I know that on top of some stunning police work, I would get the craziest, most unfair, and tragic twist ever. First of all let me say that i love this author, the series and yes the girl has done it again.. This is a real page turner, a gripping read and a fantastic police procedural. Two children have been pulled from the wreckage of a burning house. One is dead on scene and the other is fighting for his life. Where are the parents and surely they were not left in the house alone ???? It is now upto DI Fawley and his team to solve this horrendous case. I was hooked from the first page, read this book in First of all let me say that i love this author, the series and yes the girl has done it again.. This is a real page turner, a gripping read and a fantastic police procedural. Two children have been pulled from the wreckage of a burning house. One is dead on scene and the other is fighting for his life. Where are the parents and surely they were not left in the house alone ???? It is now upto DI Fawley and his team to solve this horrendous case. I was hooked from the first page, read this book in one sitting and reading until late into the night. So many suspects and so many lies. This book had me holding my breath tapping my kindle faster and faster and in places sat on the edge of my seat. The ending was not what I was expecting yes I got it wrong yet again. This is a bonus for me. No one knows what goes on behind closed doors and how well do you know the ones you love??? An easy five stars and so Highly Recommended. So yet again the wonderfully talented Cara Hunter writes another brilliant thriller in the DI Adam Fawley series and this is a series that I just can’t fault. When you pick up a book and it grips you from page one you know you are on to a winner and each of the books in this series have been just that ... 100% winners. We are reunited with the past members of the team and Adam Fawley is rather quieter in this book as he tries to deal with his ongoing personal problems, Cara Hunter is a master at So yet again the wonderfully talented Cara Hunter writes another brilliant thriller in the DI Adam Fawley series and this is a series that I just can’t fault. When you pick up a book and it grips you from page one you know you are on to a winner and each of the books in this series have been just that ... 100% winners. We are reunited with the past members of the team and Adam Fawley is rather quieter in this book as he tries to deal with his ongoing personal problems, Cara Hunter is a master at characterisation and really brings the members of the team to life and I think for me this is what makes her books so special well that and the fact I never can guess the damn ending !! So what more can I say than this book is amazing, well written, fabulous conclusion and a massive 5 Star read that shouldn’t be missed. This is a great series and this book had me hooked from the first few pages. Adam is investigating a nasty house fire where one child is dead, and the other is fighting for his life. What he can’t work out is where the parents were. The story is told in the present tense but there’s also some chapters telling the story of what happened leading up to the fire. It seems life for Samantha was not great and she was struggling to cope with two young children. There are a few shocks in store towards t This is a great series and this book had me hooked from the first few pages. There are a few shocks in store towards the end of the book and just when you think you’ve worked out what happened, it’s turned on it’s head again. Another excellent addition to the DI Adam Fawley series. A police procedural of high quality. I love the way Cara takes on the entire journey, making the reader feel like they are looking over the shoulder of the entire investigation – down the wrong path, then backtracking, the discovering of new evidence, and inching closer to the truth. Police investigate a house fire in this mystery, with two children pulled from the wreckage. But where are the parents? Evidence comes to light that shows the Another excellent addition to the DI Adam Fawley series. Police investigate a house fire in this mystery, with two children pulled from the wreckage. But where are the parents? Evidence comes to light that shows the fire was no accident. And so the investigation begins. A mesmerising read. I couldn’t put it down and read it in a day! Cara Hunter is a writer who lives in Oxford, in a street not unlike those featured in her series of crime books. Close to Home is her debut featuring DI Adam Fawley, and her second, In the Dark, is coming soon.